It’s been three years since theme park and luxury resort, Jurassic World, was destroyed by dinosaurs out of containment. Isla Nublar now sits abandoned by humans while the surviving dinosaurs fend for themselves in the jungles. Jurassic World: Fallen Kingdom, the fifth installment in Universal’s dino franchise, is bonkers. Completely, utterly - sometimes stupidly - and absolutely bonkers. That being said (and following a mindset readjustment) I think I like it. It’s a lot of fun and nonsense... but not much more. J.A. Bayona’s film works best when he leans into his horror roots. As the director of ghost genre classic, The Orphanage, Bayona is more than capable of creating terrifying tension and suspense. He is a master of horror tropes (and we get them all here), of the chilling things that lurk in the dark. However, scary movies work best in an intimate context. 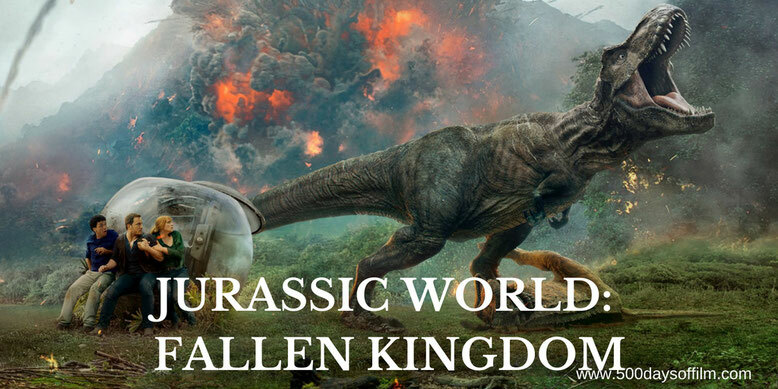 Jurassic World: Fallen Kingdom is not an intimate story - it is a juggernaut. As a result, and despite the charisma of the film’s two leads - Claire (a sensible boot wearing Bryce Dallas Howard) and Owen (another smoldering turn from Chris Pratt) - we never truly feel scared for anyone. For one thing, there’s no time to develop an emotional bond with any of Jurassic World: Fallen Kingdom’s characters. There’s just too much going on. We have a surprisingly moving extinction level event, dangerous genetic modification, animal trafficking, a conspiracy, cloning and, perhaps most important of all, the question of whether Claire and Owen will get back together. As a result, for maximum enjoyment of Jurassic World: Fallen Kingdom, check your brain in at the door, buckle up and enjoy the ride. Bayona’s film certainly has some exciting and thrilling moments. The CG is impressive - only very rarely overreaching the bounds of the film’s technical ability. Meanwhile, as you would expect from Bayona, the movie features several visually stunning (and iconic) sequences. In these moments, you see the film that Jurassic World: Fallen Kingdom could have been, had it not felt compelled to go full theme park ride. What made Jurassic Park such a timeless classic was both the fact that we really cared about the characters in Steven Spielberg’s adventure and that the film played by its own rules. In Bayona’s sequel, there are no rules. This makes for a bonkers rollercoaster experience - but nothing deeper. It’s a lot of fun but as you leave the ride, you just can’t ignore a niggling sense of disappointment. Great to see Jeff Goldblum return as Dr. Malcolm. He doesn’t get anywhere near enough screen time, however. Not that you can ever have enough Goldblum. If you haven’t seen the trailers for this movie yet… don’t. They spoil quite a number of the movie’s key scenes. Have you seen Jurassic World: Fallen Kingdom? If you have, what did you think of JA Bayona’s film? Let me know in the comments section below or over on Twitter. You can find me @500DaysOfFilm.